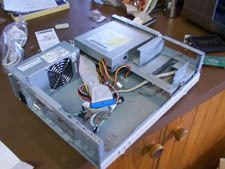 Here’s the hard drive and CD-ROM installed in the case. 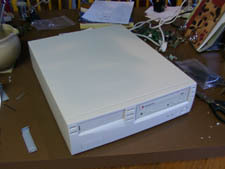 As you can probably see, even without any cables running to the CD-ROM, it’s quite cluttered already. That 40mm fan isn’t going to be doing much good. Getting the drive cage to click in was actually a bit of a challenge too. Here’s my first real gripe with the case. As you can probably figure out, the motherboard I’m installing is a MicroATX Pentium II motherboard (the AOpen MX6E with a Pentium II 333@411 in fact), as it’s the only mATX board I had at the time. Ironically enough though, it’s an AOpen motherboard, case and power supply, yet the ATX power cable is barely long enough to reach the connector on the motherboard with the CPU installed. It’s quite a tight fit, and required some pressure on the connector to get it to click. 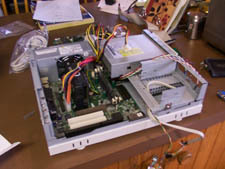 Also worth noting in that photo is the closeness of the RAM slots, IDE connectors and CD-ROM. Most motherboards will be a very tight fit in this case, and will require some fiddling to actually go in. Here we see the fully assembled system, unused wires tied back and all. I found out after taking this shot that those USB and sound cables can be unplugged completely. 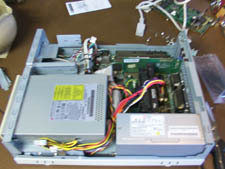 Keen-eyed readers will notice that there’s no cover on the back of the PCI slots holding the network and video cards. This is because I don’t have any true slimline cards, and had to remove the metal plates. Anyone skillful enough who possesses the right tools should be able to modify the existing covers though. Here comes another problem – the case isn’t big enough to fit those Radeon 9700’s or GeForce4 Ti4600’s. You need to buy slimline cards, which at the moment are only available in the form of value cards such as the Radeon 9000 or GeForce4 MX, and are usually more expensive than the larger cards based on a reference design. If you’re just building a HTPC, you might be better off with a motherboard such as the VIA EPIA motherboards (reviewed here), which have onboard TV output and are probably cheaper than the separate mATX motherboard, CPU and video card. If you’re after something for gaming though, you’ll need to buy a slimline 3D accelerator. Here’s the system built and in action (running the graphical login under Slackware Linux 8.1, for the curious). 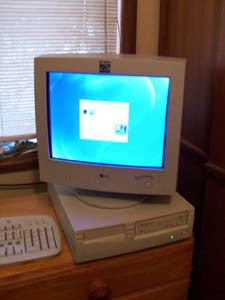 Surprisingly enough, it keeps pretty cool, even with an overclocked Pentium II 333 @ 411 CPU. The H340A is a brilliant slimline case: it’s more expandable than the cube cases in a way, fits in with home theater systems more easily, can fit a wider range of motherboards and CPUs and is easy to carry to LANs. The only letdown is the need for low profile expansion cards, but it’s a small price to pay. This case is highly recommended to anyone building a HTPC or LAN system on a budget.